Classical Hodgkin lymphoma is considered a highly curable disease; however, 20% of patients cannot be cured with standard first-line chemotherapy and have a dismal outcome. Current clinical parameters do not allow accurate risk stratification, and personalized therapies are lacking. In fact, Hodgkin lymphoma (HL) is often over- or undertreated because of this lack of accurate risk stratification. In recent years, the early detection of chemoresistance by fluorodeoxyglucose positron emission tomography has become the most important prognostic tool in the management of HL. However, to date, no prognostic scores or molecular markers are available for the early identification of patients at very high risk of failure of induction therapy. In the last decade, many important advances have been made in understanding the biology of HL. In particular, the development of new molecular profiling technologies, such as SNP arrays, comparative genomic hybridization, and gene-expression profiling, have allowed the identification of new prognostic factors that may be useful for risk stratification and predicting response to chemotherapy. In this review, we focus on the prognostic tools and biomarkers that are available for newly diagnosed HL, and we highlight recent advances in the genomic characterization of classical HL and potential targets for therapy. The age-standardized incidence rate of Hodgkin lymphoma (HL) is 1 per 100,000, with a worldwide incidence of 67,887 cases in 2008 . HL comprises approximately 11% of all lymphomas in western countries and has a bimodal age distribution, with a first peak in young adults and a second peak around 59 years of age [1, 2]. HL is currently classified as two distinct disease entities: nodular lymphocyte-predominant HL (NLPHL) and classical Hodgkin lymphoma (cHL) [2, 3]. In fact, these histologic subtypes have different clinical presentations, age distributions, and prognoses. From a biological and clinical point of view, NLPHL is now viewed as a distinct disease entity that is more similar to indolent B-cell non-HL than to cHL . The prognosis for patients with NLPHL is usually good, sometimes even without treatment [2, 4]. A recent study showed that NLPHL is characterized by a distinct gene-expression signature . The characteristic Hodgkin and Reed-Sternberg (HRS) cells in cHL, and the lymphocytic and histiocytic (L and H) cells in NLPHL, account for only 1% to 5% of the entire tumor mass and grow in a unique tumor microenvironment composed of many different cell types, including T cells, B cells, macrophages, neutrophils, eosinophils, plasma cells, mast cells, and fibroblasts . cHL is further divided into four histologic subtypes: nodular-sclerosis classical Hodgkin lymphoma (NSCHL), lymphocyte-rich classical Hodgkin lymphoma (LRCHL), mixed-cellularity classical Hodgkin lymphoma (MCCHL), and lymphocyte-depletion classical Hodgkin lymphoma (LDCHL) . Although this classification is mainly based on histopathology, taking into account differences in the composition of the reactive infiltrate and stroma, recent studies have demonstrated that these disease entities are biologically different, with different genomic alterations, gene-expression patterns, cytokine milieu, and clinical behavior [6, 7]. The epidemiology, clinical presentation, and prognosis of these subtypes are also different , but these differences have not yet been translated into changes in the treatment approach, since the adriamycin (doxorubicin), bleomycin, vinblastine, dacarbazine (ABVD) chemotherapy regimen remains the mainstay for the treatment of all cHL subtypes. NSCHL affects young adults, is more common in females, and frequently involves the mediastinum, which comprises the tissues and organs of the chest, excluding the lungs. It is less frequently associated with Epstein-Barr virus (EBV) infection and probably requires an intact immune system to develop, as the incidence in HIV-positive patients declines as the number of CD4+ lymphocytes declines [2, 9]. Several studies using gene-expression profiling and expression of surface markers have suggested a link between mediastinal NSCHL and primary mediastinal B-cell lymphoma . In contrast, MCCHL and LDCHL have epidemiological and clinical features that are distinct from NSCHL: they are more frequent in males, have a bimodal age distribution, are frequently associated with EBV and HIV infection, and normally spare the mediastinum. The prognosis for MCCHL and LDCHL is worse than for NSCHL . LRCHL is characterized by older age at presentation, infrequent mediastinal involvement, and excellent prognosis [2, 8, 11]. The clinical characteristics of the different subtypes of cHL are listed in Table 1. ABVD, adriamycin, bleomycin, vinblastine, dacarbazine; cHL, classical Hodgkin lymphoma; LDCHL, lymphocyte-depletion classical Hodgkin lymphoma; LRCHL, lymphocyte-rich classical Hodgkin lymphoma; MCCHL, mixed-cellularity classical Hodgkin lymphoma; NLPHL, nodular lymphocyte-predominant Hodgkin lymphoma; NSCHL, nodular-sclerosis classical Hodgkin lymphoma; PFS, progression-free survival; RT, radiotherapy. cHL is generally considered a highly curable disease, with approximately 80% of patients cured with standard first-line chemotherapy. Approximately 15% to 20% of patients with limited-stage (that is, stage I to II) disease and 35% to 40% of patients with advanced-stage (stage III to IV) disease have disease relapse or disease that is refractory to first-line chemotherapy [12, 13]. Current first-line therapy consists of four to six cycles of ABVD chemotherapy  followed by radiotherapy when indicated [15–17]. About half of all patients who have disease relapse after first-line chemotherapy have their disease successfully treated with high-dose chemotherapy followed by autologous stem cell transplantation [18, 19]. The treatment decision algorithm for cHL is based on clinical parameters: the Ann Arbor staging system is the main staging system used and allows distinction between early-stage and advanced-stage disease ; the International Prognostic Score (IPS) is the standard for risk stratification of patients with advanced disease (0 to 7 scale), but is not applicable to patients with early-stage HL . This very simplified risk stratification determines the lack of differentiated and personalized treatment options in clinical practice. For this reason, HL is often over- or undertreated [22, 23]. Cytotoxic chemotherapy may lead to short- and long-term toxicities that can affect the final outcome; a recent study of reduced treatment intensity in early-stage HL found that even though more than 90% of patients were disease-free 5 years after the initial diagnosis following chemoradiotherapy, the first cause of death during the follow-up period was secondary neoplasia, and more than 50% of all deaths (4.8% of all patients) were possibly related to the delivered treatment . Because HL is a highly curable cancer, future research is focusing on identifying patients with a low probability of cure and who may benefit from more novel and/or intensive therapies, and those with a high probability of having their disease cured and who may be suitable for less toxic therapies. Thus, better risk stratification is needed to develop strategies aimed at improving the cure rate while reducing treatment-related toxicity. In recent years, fluorodeoxyglucose (FDG) positron emission tomography (PET) (FDG-PET) has significantly changed the management of HL: it is now the basis for the initial staging and risk-adapted therapy approach. In fact, early-interim FDG-PET (a PET scan performed after two cycles of ABVD chemotherapy) has emerged as the most important prognostic tool in HL [25–27], and many ongoing clinical trials are testing the role of interim PET-oriented therapy in HL . This early-interim imaging is most relevant for early-stage disease in which overall survival (OS) is compromised by treatment-related mortality (mainly long-term toxicities of the treatment regimen; these include secondary tumors and cardiovascular events) . In the last decade, many important advances have been made in understanding the biology of HL. In particular, new molecular profiling technologies, such as genome-copy number analysis with SNP arrays or array comparative genomic hybridization (aCGH), and gene expression profiling, have allowed the identification of new prognostic factors that may be useful for risk stratification and predicting response to chemotherapy. This review summarizes the prognostic tools and biomarkers that are available for characterizing newly diagnosed HL, and highlights recent advances in genomic studies of cHL and their implications for predicting treatment outcome and for identifying potential targets for therapy. Recent advances in the genomic characterization of HL have led to a better understanding of HL pathobiology. Several studies have assessed the association between SNPs in cytokine genes and risks of developing different cancers, including HL. In a recent study, Monroy et al. (2011) compared 200 HL cases and 220 controls to assess the relationship between genetic polymorphisms in cytokine genes and susceptibility for developing HL . SNPs for 38 preselected genes involved in cytokine signaling were considered. Interestingly, the authors found a correlation between a combination of allelic variants of COX2, IL18, ILR4, and IL10 and risk of developing HL. These results highlight the importance of the tumor microenvironment and the role of aberrant cytokine signaling in the pathogenesis of HL. In addition, using the same study group, Monroy et al. (2011) showed that genetic variants in DNA repair genes are significantly correlated with the risk of HL . A similar method was used to identify susceptibility loci for cHL in a recent study considering 589 cHL cases and 5,199 controls . Three new susceptibility loci were identified that map to chromosome 2p16.1 (corresponding to the REL gene, encoding c-REL, a member of the NF-kB family), 8q24.21 (encompassing PVT1, a gene involved in MYC-mediated lymphomagenesis), and 10p14 (which contains the GATA3 gene, a master regulator of T2 differentiation) . In another study, Lorenzo and colleagues used a genomic approach to detect differential expression of genes potentially involved in the development of secondary neoplasms in HL patients . The incidence of secondary tumors in HL patients has historically been linked mainly to age and type of treatment received, with the highest risk related to the use of radiation therapy and alkylating agents. In that study, the levels of DNA damage, DNA damage repair capabilities, and differential expression of a set of genes involved in these pathways were analyzed in three groups of patients: those with HL who developed a second neoplasm, those with HL without a second neoplasm, and healthy controls. The level of DNA damage was higher in the patients with HL who had secondary tumors than in the patients with HL who did not develop secondary tumors, and was higher in the patients with HL without secondary tumors than in the healthy controls. In addition, a set of genes involved in DNA repair, drug metabolism, the cell cycle, and cell proliferation was differentially expressed across the three groups. These results are of particular interest because constitutive defects in DNA repair mechanisms and increased sensitivity to carcinogens may potentially be involved in the development and pathogenesis of HL, as well as secondary neoplasms. Recent advances in our understanding of HL biology and interactions between HRS cells and the tumor microenvironment have led to the development of potential new prognostic factors, biomarkers of disease activity, and targets for therapy. Several retrospective studies have evaluated prognostic factors that are linked to HRS cell biology, such as p53 and Bcl-2 expression, by immunohistochemical analysis . Bcl-2 and p53 have opposite roles in tumorigenesis. Bcl-2 overexpression leads to cell survival by inhibiting apoptosis [34, 35], whereas p53 is essential for regulating cell death by inducing apoptosis following cell damage in response to cytotoxic agents [36–38]. Although defective p53 function has been related to chemoresistance in a variety of tumors [36, 39, 40], no such data exist for HL , perhaps because of the great variability among the results of various studies regarding p53 production (p53 production varies from 10% to 90% in cHL [42–44]) [44–46]. The antiapoptotic factor Bcl-2 may be involved in the pathogenesis of cHL, as it has been shown that HRS cells are derived from germinal-center B cells that lack immunoglobulin expression . Normally, these aberrant cells undergo apoptosis, but dysregulation of the Bcl-2 pathway may provide a way for the cells to escape the apoptotic program . The prognostic value of Bcl-2 in cHL has been extensively examined in several studies [33, 44, 46–50]. Two independent studies specifically examining the prognostic role of Bcl-2 expression have shown that Bcl-2 is an independent factor that predicts poor prognosis in cHL when considered together with clinical variables [33, 47]. Other prognostic biomarkers evaluated by immunohistochemical analysis that have been shown to correlate with adverse outcomes are topoisomerase IIα (a ubiquitous enzyme that plays an essential role in the control of replicative DNA synthesis), human leukocyte antigen class II, and myelin and lymphocyte protein (a membrane protein involved in lipid-raft organization during T-cell activation) [51–55]. The most important immunohistochemical markers related to HRS cells are shown in Table 2.
aThe presence (+) or absence (-) of a significant correlation (positive ↑ or negative ↓) with the study endpoints. bTwo different antibodies against p53 were used in this study. Bcl-2, B-cell lymphoma 2; DSS, disease-specific survival; EFS, event-free survival; FFS, failure-free survival; HLA, human leukocyte antigen; MAL, myelin and lymphocyte protein; NA, not applicable; OS, overall survival; PFS, progression-free survival; TTF, time to treatment failure. HRS cells are involved in regulating the cellular composition of the microenvironment by secreting cytokines and chemokines that selectively attract certain cells . For example, CD4+ T-helper cells are attracted by HRS cells through secretion of the chemokines TARC (thymus and activation-regulated chemokine) and RANTES (regulated upon activation normal T-cell expressed, and secreted) . HRS cells can also express the programmed death (PD) ligands 1 and 2 that in turn interact with regulatory T cells (Tregs) and PD1+ T cells [57–59] to promote their immunosuppressive functions. In fact, regulatory CD4+ CD25+ T cells inhibit the function of natural killer (NK) and CD8+ cytotoxic T cells . In this context, FOXP3 (forkhead box P3)+ T cells play a major role in converting naive CD4+ CD25- T cells into CD4+ CD25+ Tregs . TIA1 (cytotoxic granule-associated RNA-binding protein) is a marker of CD8+ cytotoxic T cells and its production is independent of activation status. Granzyme B (GrB) and perforin production are features of NK cells and CD8+ activated T cells . Because the absence of effective immune surveillance is related to the pathogenesis of HL and the presence of Tregs is correlated with poor outcome in solid tumors , several studies have addressed the prognostic impact of the cellular composition of the microenvironment. Surprisingly, three large retrospective studies have shown that the presence of intratumoral Tregs, as determined by the identification of FOXP3+ cells, is associated with better outcomes for patients with HL [50, 64, 65]. In contrast, increased numbers of cytotoxic T cells, as determined by the identification of TIA1 and GrB+ cells either individually  or in the absence of FOXP3+ cells , correlated with poor outcomes. Recently, a combined prognostic score based on both FOXP3 and the macrophage marker CD68 (see next paragraph) was examined in a cohort of 122 patients . In preliminary findings when both CD68 and FOXP3 were used as prognostic markers, the authors identified three different prognostic groups, and this prognostic score retained its significance for failure-free survival (FFS) and OS in the subgroups of patients presenting with early- and advanced-stage disease. Importantly, this combined score identified a subset of patients with early-stage disease at high risk of relapse/progression (5-year FFS, 25%). While these data apply to patients treated with conventional combination chemotherapy regimens, it is unknown how these factors would influence treatment outcomes in patients treated with targeted therapies. Table 3 summarizes the main immunohistochemical prognostic markers related to the tumor microenvironment. DSS, disease-specific survival; DFS, disease-free survival; EFS, event-free survival; FFS, failure-free survival; FOXP3, forkhead box P3; GrB, granzyme B; HLA, human leukocyte antigen; NA, not applicable; OS, overall survival; PFS, progression-free survival; TAM, tumor-associated macrophage; TIA1, cytotoxic granule-associated RNA-binding protein; Treg, regulatory T cell. Using gene expression profiling, Steidl et al. evaluated 130 fresh-frozen samples from newly diagnosed patients with HL treated with ABVD or equivalent regimens . Among the patients whose disease did not respond to treatment, genes signatures of tumor-related macrophages and monocytes, angiogenic cells, adipocytes, and HRS cells were overexpressed, and gene signatures of germinal center B cells were underexpressed. These findings were confirmed in an independent cohort of 166 patients, using immunohistochemical analysis. An increased number of CD68+ macrophages correlated with shorter progression-free survival (PFS) after primary treatment and lower relapse rates after autologous stem cell transplantation. In the multivariate analysis, CD68 outperformed the IPS score for predicting disease-specific survival (DSS). Interestingly, using this score it was possible to identify a subset of patients with early-stage disease (stage I and II according to the Ann Arbor staging system) who had fewer than 5% CD68+ cells, with a disease-specific survival rate of 100% (Table 3). These results were consistent with findings reported by other groups [66, 69] that analyzed the prognostic value of tumor-infiltrating macrophages and lack of CD20+ B cells in the tumor microenvironment. The results of Steidl et al. are of particular importance as pretreatment measurement of CD68 can be used to identify not only patients at high-risk of disease relapse or progression but also those with early-stage disease; patients who have an excellent prognosis are currently overtreated with the available chemoradiotherapeutic approaches. The prognostic value of CD68+ tumor-infiltrating macrophages has also been reported in a recent study of 288 patients with cHL . From a biological point of view, tumor-associated macrophages have been associated with adverse outcomes in many different types of cancer, and they are now known to mediate tumor vessel formation through secretion of vascular endothelial growth factor and hypoxia-inducible factor 1α [23, 71, 72]. In another study, Chetaille et al. (2009) analyzed the gene-expression profiles of a set of 63 cHL samples from patients with early- and advanced-stage disease using DNA microarrays. The authors found that expression of the B-cell gene signature was associated with better outcomes . In addition, an increase in the number of CD20+ infiltrating B cells, as analyzed by immunohistochemical analysis, was associated with improved outcomes (Table 3). These results highlight the relevance of a B-cell reactive infiltrate for an efficient immune response. Interestingly, Chetaille et al. showed that the molecular profile of EBV-positive tumors was significantly different from that of EBV-negative tumors and was characterized by a specific T-helper cell 1 signature, providing a rationale for specific treatment strategies . In addition, the study by Steidl et al. showed that CD20 expression in small B cells (as detected by immunohistochemical analysis) was associated with prolonged PFS in the univariate analysis but was not an independent predictor of prognosis in the multivariate analysis. On the other hand, the number of CD20+ HRS cells, which was analyzed separately, was not associated with treatment outcomes. Previously published studies evaluating the role of CD20+ HRS cells detected by immunohistochemical analysis have reported conflicting results [48, 73–75]. Therefore, we conclude that there is no consensus on the prognostic significance of CD20+ expression in HRS cells as an immunohistochemical marker (Table 3). However, the association of high levels of intratumoral B cells with good outcomes is consistent with the excellent prognosis of the LRHL subgroup. Recently, three sequential studies using gene expression profiling of paraffin-embedded HL tissue samples from the Spanish Hodgkin Lymphoma Study Group described the impact of different gene expression signatures related to both HRS cells and the HL microenvironment on treatment outcomes [76–78]. In the first two studies [76, 78], the investigators identified a group of genes differentially expressed in HRS cells and the HL tumor microenvironment that were demonstrated to significantly affect outcomes in HL. These genes belonged to several pathways already known to be involved in HL pathogenesis: the G2/M transition and spindle checkpoint (for example, AURKA, MAD2L1, BUB1B, and CDK1), drug resistance and metabolism (the gene encoding topoisomerase 2α, and TYMS, and RRM2), the chaperone pathway, and genes related to the activity of the tumor microenvironment (T-cell and monocyte/macrophage activation). In the most recent study, the prognostic impact of 30 genes chosen on the basis of the previous two studies was evaluated in 282 paraffin-embedded cHL samples in order to build a prognostic model . A model that included 11 genes belonging to four functional pathways (that is, apoptosis, cell-cycle regulation, macrophage activation, and interferon regulatory factor 4) could predict the risk of relapse and when integrated with the clinical variable stage IV, allowed the identification of a subgroup characterized by dismal outcomes (5-year FFS of 25%). Table 4 summarizes the most important genomic studies of outcome in cHL. aCGH, array comparative genomic hybridization; BCR, B-cell receptor; GEP, gene-expression profile; HRS, Hodgkin and Reed-Sternberg (cell); MAPK, mitogen activated protein kinase; ME, microenvironment; SNP, single-nucleotide polymorphism. Recent studies have identified novel genes related to chemotherapy response, including refractory disease. In addition, the prognostic value of tools for functional imaging (FDG-PET) and assessment of thymus and activation-regulated chemokine (TARC) levels during treatment has been investigated. A subset of patients has disease that is refractory to primary standard chemotherapy (primary refractory disease), and these patients have dismal outcomes following all subsequent treatments . Even with high-dose chemotherapy followed by autologous stem cell transplantation, only a minority of patients with primary refractory disease can be cured . This group of patients can be well defined regarding their treatment outcomes; however, no prognostic score or diagnostic tools are available for the early identification of patients at very-high risk for failure of induction therapy. A study by Hartmann et al. (2008) described genomic imbalances in microdissected HRS cells, analyzed using aCGH . Several genes belonging to the main cell-survival pathways known to be activated in HL (that is, those encoding JAK/STAT, NF-κB, and AP1-JUN-B) were found to be affected. However, the authors did not analyze the correlation between these gene imbalances and outcomes. Recently, Steidl and coworkers reported the results of a genome copy-number aCGH analysis in microdissected HRS cells from two groups of patients: those with disease that was responsive to primary therapy and those with disease that was refractory to primary therapy (Table 4) . Copy number gains on chromosome 16p were significantly more frequent in patients with primary refractory disease and strongly correlated with prognosis after ABVD chemotherapy. More than 80% of patients with primary refractory disease had gains on 16p, compared with 33% of patients with early-disease relapse, and 25% of patients with late-disease relapse. Interestingly, the multidrug resistance gene ABCC1, which is overexpressed in a variety of solid tumors, is located on cytoband 16p13.11 (Table 4). In addition, frequent losses on 4q27 (harboring the IL2/IL21 genes) and 17p12, and gains on 19q13.3 (BCL3/RELB) were recently described to be associated with resistance to ABVD chemotherapy in cHL . Lourenço et al. (2010) investigated the influence of genetic polymorphisms in the gene encoding glutathione S-transferase (an enzyme family involved in the metabolism of alkylating agents and anthracyclines) on the outcomes of 125 patients with cHL . Specific polymorphisms of genes encoding glutathione S-transferase significantly affected DFS and OS and were associated with higher chemotherapy toxicities (Table 4). These studies represent excellent examples of how new genomic technologies can be used to select prognostic factors and functionally evaluate their role in oncogenesis. In contrast to normal differentiated cells, which rely primarily on mitochondrial oxidative phosphorylation to generate the energy needed for cellular functions, most cancer cells rely on aerobic glycolysis, a phenomenon termed 'the Warburg effect' [84, 85]. For these reasons, neoplastic lymphocytes utilize higher amounts of glucose than their normal counterparts . Fluorine-18 FDG-PET is a functional imaging test that measures FDG uptake by cells, and is used in the management of both HL and non-HL. In the case of HL, the HRS cells in the tumor tissue display low and variable expression of glucose transporters, and the levels of these transporters and FDG uptake in tumor cells have not been reported to be correlated [87, 88]. In contrast, the non-neoplastic inflammatory cells that comprise the tumor microenvironment show high FDG uptake, which is further increased by exposure to inflammatory cytokines . Because more than 90% of the entire tumor mass is composed of these inflammatory cells in HL, we can conclude that the FDG uptake may be viewed primarily as a biomarker for the metabolic activity of the tumor microenvironment. Studies that have assessed FDG-PET as a prognostic tool used during chemotherapy have reported that it is useful for predicting poor outcomes and building a risk-adapted therapy approach in HL. A study conducted by Gallamini et al. (2007) showed a 2-year PFS of 12% for cHL patients with a positive interim PET scan after two cycles of ABVD chemotherapy, compared with 95% for patients with negative interim PET scans . Remarkably, in that study interim PET was more predictive of outcome than the IPS score. Other reports have shown similar results [26, 27] (Table 5). The presence (+) or absence (-) of a significant correlation with the study endpoints is given. NA, not applicable; OS, overall survival; PET, positron emission tomography; PFS, progression-fee survival; RR, response rate; TARC, thymus and activation-regulated chemokine. However, because all studies published to date have been retrospective, the prognostic value of interim PET needs to be validated in a prospective study. Furthermore, the interpretation of interim PET scans should be standardized. On the basis of the results of these studies, many recent prospective clinical trials have been designed to build risk-directed therapy algorithms in order to minimize chemotherapy cycles, with the goal of eventually avoiding radiotherapy for patients with early negative-interim PET scans and intensifying treatment in patients with positive-interim PET scans . The clinical results of risk stratification based on interim PET and the fact that FDG uptake reflects the metabolic activity of the surrounding inflammatory cells rather than the HRS cells again highlights the importance of the tumor microenvironment in the pathogenesis of HL. Because accurate PET results depend on intact glucose transporter mechanisms in cell membranes, caution should be exercised when PET is used to evaluate response to investigational targeted agents that may alter the expression of glucose transporter proteins . TARC is a chemokine normally produced by antigen-presenting cells, such as dendritic cells. TARC attracts T-helper 2 cells through its interaction with the C-C chemokine receptor type 4 . HRS cells secrete an abundant amount of TARC, contributing to the attraction and homing of activated Th2 lymphocytes [3, 56, 91]. Elevated pretreatment levels of TARC production have been correlated with adverse outcomes in patients with HL , and permanently high TARC levels after treatment are related to shorter PFS and OS (Table 3). In a recent preliminary study, changes in plasma TARC levels before and during treatment were correlated with the results of functional metabolic PET imaging . Interestingly, mid-treatment plasma TARC levels outperformed mid-treatment FDG-PET imaging in predicting response to therapy, and after one chemotherapy cycle TARC levels could be used to predict final response to treatment (Table 5). A prospective evaluation of TARC levels before and during treatment in future clinical trials is needed to confirm the prognostic value of plasma TARC levels in predicting outcomes in cHL patients. If these preliminary results are confirmed, we suggest that it might be more practical to measure interim TARC than to use interim PET, as this approach is cheaper and the results are more reproducible across different centers. Several new prognostic factors for HL have been identified during the past 10 years. However, the majority of the reports of prognostic factors for HL are retrospective analyses, and the results need to be validated prospectively before using them in clinical practice. The ultimate goal of using prognostic markers to predict outcomes is to achieve a personalized therapeutic approach, avoiding overtreatment and toxicity for some patients, and undertreatment or exposure to ineffective cytotoxic agents for other patients at higher risk of disease relapse. New genomic technologies have allowed a better understanding of the pathogenesis of cHL, with the identification of polymorphisms associated with increased risk of disease and alteration of genes involved in response to treatment. Furthermore, gene expression profiling studies have identified specific gene signatures associated with outcomes (for example, tumor-infiltrating macrophages and B cells) that could be easily detected by specific immunohistochemical markers expressed on the cell surface (for example, Bcl-2, CD68, CD20, and FOXP3). It is now becoming clear that cHL, considered in the past to be a single disease entity with some pathological variants, comprises many different diseases characterized by distinct biologies, prognostic biomarker expression profiles, and response to therapies. In addition, recent progress in the functional imaging and monitoring of biomarkers during treatment have provided the basis for a risk-adapted therapy approach that is currently being tested in clinical trials. The identification of new biomarkers in HL may provide potential targets for the development of new treatment agents. HRS cells display simultaneous activation of different cell-survival pathways, including NF-κB, JAK/STAT, PIP3K/AKT/mTOR, NOTCH, and RAF/MEK/ERK, and many different drugs against various targets are now being evaluated clinically (Table 6; Figure 1) [94–103]. The final results from a phase I trial of brentuximab vedotin (an anti-CD30 antibody conjugated with the anti-tubulin agent monomethyl auristatin E) in patients with relapsed CD30+ lymphomas have recently been reported : in a group of 45 heavily pretreated patients, 86% experienced reductions in their tumor size, with 24% complete responses. These results confirm that the rational identification of new targets and new agents may have a significant impact on the natural history of this disease. Even though many of these new drugs have shown little activity as single agents, the simultaneous targeting of multiple survival pathways and the tumor microenvironment through rationally designed treatment combinations could further enhance their activity. CR, complete response; HDACs, histone deacetylases; JAK2, Janus kinase 2; mTOR, mammalian target of rapamycin; NF, nuclear factor; PR, partial response. Prognostic factors, pathways, and potential therapeutic targets involved in the pathogenesis of classical Hodgkin lymphoma. Prognostic factors associated with good outcome are shown in blue, and prognostic factors associated with poor outcome are shown in red. 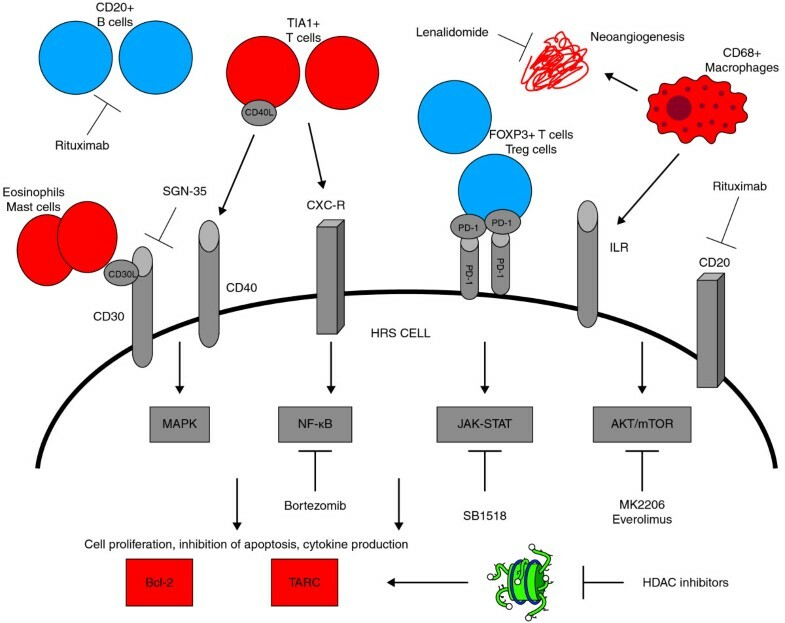 This figure shows the most important prognostic factors involved in the pathogenesis of cHL, with particular attention to the role of tumor microenvironment, the main activated intracellular signaling pathways and potential targets for therapies. CD 20+ B cells and FOXP3 + T regulatory cells in the tumor microenvironment, are associated with good outcome, whereas CD 68+ macrophages, TIA1+ T cells and MAST cells are associated to poor prognosis. Also the expression of the antiapoptotic protein bcl-2 in HRS cells and increased plasma levels of the chemokine TARC have been related to worse prognosis. Notably the activation of intracellular signalling pathways mediated by autocrine and paracrine cytokine loops, leads to increased expression of bcl-2 and TARC production. The engagement of surface receptors such as CD 30, CD 40, CD 20, IL-R, CXC-R by their ligands, leads to the activation of the oncogenic NF-kB, JAK-STAT, AKT- mTOR and MAPK pathways. A number of drugs that selectively inhibit these targets are currently under clinical investigation. Bcl-2, B-cell lymphoma 2; FOXP3, forkhead box P3; HDAC, histone deacetylase; HRS, Hodgkin and Reed-Sternberg; ILR, interleukin receptor; JAK, Janus kinase; MAPK, mitogen activated protein kinase; mTOR, mammalian target of rapamycin; NF, nuclear factor; PD-1, programmed death 1; PDL1, programmed death 1 ligand 1; TARC, thymus and activation-regulated chemokine; TIA1, cytotoxic granule-associated RNA-binding protein; Treg, regulatory T cell. ED conceived the article design and content, and wrote the paper. AY conceived the article design and content, wrote the paper, and approved the final manuscript.